Since the early nineties down to the present time there has been no more prominent figure in European yachting than H.I.M. the German Emperor. He was elected a member of the Royal Yacht Squadron in 1889, and for many years after that he made it a custom to be present at the annual regatta. Those years are still numbered amongst the most important in the history of the sport. Big-class racing was never more flourishing than in the early nineties, and the brilliance of the social functions at Cowes, during that period, has never been surpassed. Meteor. H. I. M. The German Emperor. the Queen’s Cup at the Squadron Regatta. He raced this vessel until 1895, one of her last races being a private match with Mr. Jameson’s cutter Iverna, at a time when both vessels were outclassed by new yachts such as Britannia, Valkyrie, Satanita, etc. In the autumn of the last-named year an order was placed for a new yacht, and Meteor II. was built on the Clyde from G. L. Watson’s designs, and came out in the following year. There are still some yachtsmen who profess the belief that this cutter was Watson’s masterpiece. She was un­doubtedly a magnificent craft, and when in 1899 she came out in yawl rig she proved almost invincible. The first Meteor (ex Thistle) had been turned over to the Imperial Navy for the use of the naval cadets, and in 1902 Meteor II. was handed over for the same purpose, His Majesty having placed an order for another new craft, this time a schooner, which was built in America. Meteor III. was launched in the early spring of that year with great ceremony. H.I.H. Prince Henry journeyed to America to be present at the launch as representative of the Emperor, and the christening ceremony was performed by Miss Alice Roosevelt, daughter of the President of the United States. This vessel is 361 tons. She races regularly at the Kiel regattas, and also pays a visit to Cowes every year. She has a great turn of speed in reaching, but is not intended purely for racing. 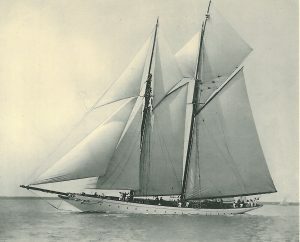 In 1895 Vineta was built at Kiel for the Emperor from G. L. Watson’s designs, and three years later the American schooner Tampa was purchased by His Majesty and renamed Iduna, and now sails under the Empress’s flag. Vineta was afterwards presented to the Grand Duke Ferdinand of Schleswig-Holstein. In 1892 the Kaiserlicher Yacht Club was formed, upon the dissolution of the Navy Regatta Society, and His Majesty accepted the post of Commodore, while Prince Henry became Vice-Commodore. With the incentive thus provided by His Majesty, the sport has flourished in Germany, and the membership of the club, which had been under 500 in the year of its foundation, rose to more than three times that number in ten years. In his desire to develop the sport thoroughly, the Emperor fosters every branch of it. He is not content simply to take an active part in the big-class racing, but does all in his power to encourage the smaller classes, which now form quite a feature of the annual regatta at Kiel. A series of international races for the Sonderklasse—boats manned by amateur crews of three—has been in institution in the Baltic for some years, and does much to promote Corinthian sport. In 1897, the year of Queen Victoria’s Diamond Jubilee, the Emperor gave a prize for a race for British yachts from Dover to Heligoland, and since then, with the exception of one year, the race for the ‘Heligoland Cup’ has been an annual fixture, and has been the means of attracting many English vessels to the Baltic regattas. The development of yachting in German waters has been so remarkable that the Kiel Week has been recognised for many years as one of the principal events in the yachting calendar. Only at Cowes will a greater gathering of yachts be seen, while in regard to the number of competing vessels the Baltic port surpasses Cowes. Amongst important prizes won in this country by the Emperor are—a Queen’s Cup at the Squadron Regatta in 1893, won by the first Meteor ; Queen’s Cups at the Royal Northern and the Royal Ulster Regattas in 1896 and 1897 respectively, won by Meteor II. 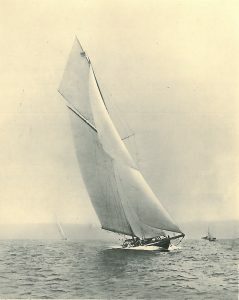 as a cutter; and the Queen’s Cup at the Squadron in 1899, won by Meteor II. in yawl rig. In the last-named instance Meteor had been heavily handicapped, but she sailed superbly, and in the evening, after the race, a telegram was received from the Emperor expressing his delight at winning the trophy in the face of such a heavy penalty. In 1903 Meteor III. won the King’s Cup at Cowes. The memorable race from Sandy Hook to the Lizard in 1905 was for a cup and prizes presented by His Majesty. Yachting in this country, as well as in Germany, is under a deep obligation to H.I.M. 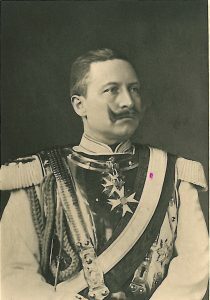 Wilhelm II.